What are you doing Saturday, July 19th? Coming to the First Annual All Write Now! Conference, of course! The first annual All Write Now! Conference, co-sponsored by Southeast Missouri Writers’ Guild and Heartland Writers Guild will be Saturday, July 19, 2014 at the Cape Girardeau Library, 711 North Clark Street, Cape Girardeau, Missouri, from 9:15 a.m. - 4:30 p.m.
Workshops on the writing craft, a panel discussion by small press publishers, and pitch sessions will take place throughout the day. Registration for the full day plus lunch are included in the $50 registration fee. For an additional fee of $30, registrants may sign up for a one-page, written-only critiques from any of the publishers. Registration forms are at the All Write Now! Facebook page. For more information and to have forms sent via email, contact: Donna J. Essner, Southeast MO Writers’ Guild president at djessner6@gmail.com. Put AWN CONFERENCE in the subject line. Seating is limited. We'll see you in July, all right? All in attendance were welcomed and guests and new members acknowledged. A reminder was given regarding the mini-conference planned for July 19, 2014 at the Cape Girardeau Public Library. A signup sheet was passed around for position openings to assist in the conference. Donna announced that a Missouri Writers’ Guild leadership conference will be held on October 18, 2014 in Jefferson City. The board of directors will meet with delegates from MWG chapters throughout the state to discuss the future of MWG as well as ways to generate income in order to put the Guild in a stable financial position. Other items on the agenda will be benefits to members, how to generate more interest in the Guild, the conference, and volunteering. She asked members to consider items they would like to see addressed at the conference. Ideas/suggestions can be emailed to Donna at semowgpres@gmail.com. Next, guest speaker, Randy McWilson, was introduced. 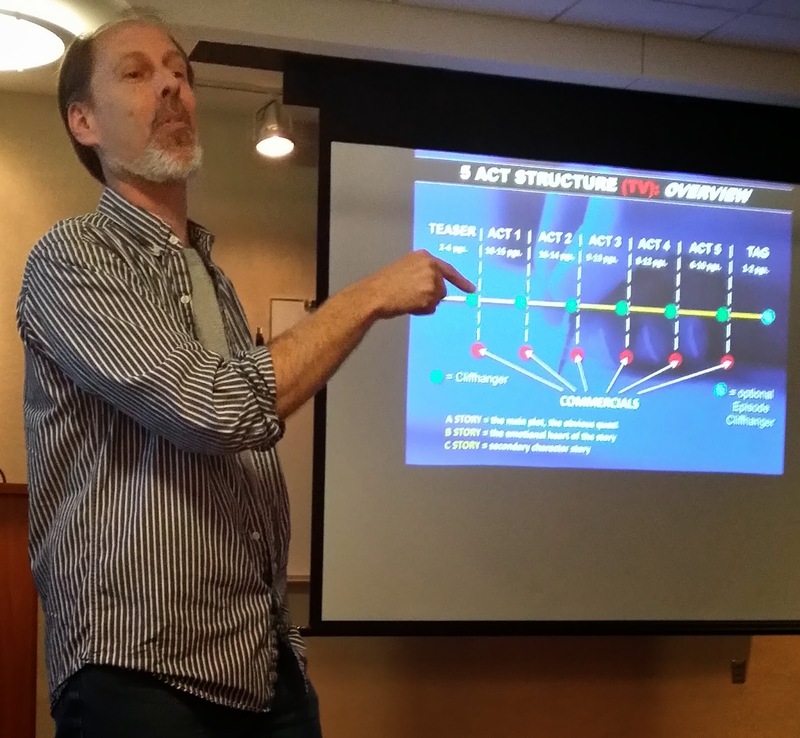 His presentation pertained to the difference in screen writing versus fiction writing. McWilson teaches at the Cape Central Career and Technology Center in Cape Girardeau, and teaches screen writing and film He is also a science fiction writer and a screen writer (film) who is attempting to break into TV. A trailer he created for his novel series entitled, “Back to Normal” was viewed. McWilson emphasized that there are profound differences in screenwriting and novel writing. 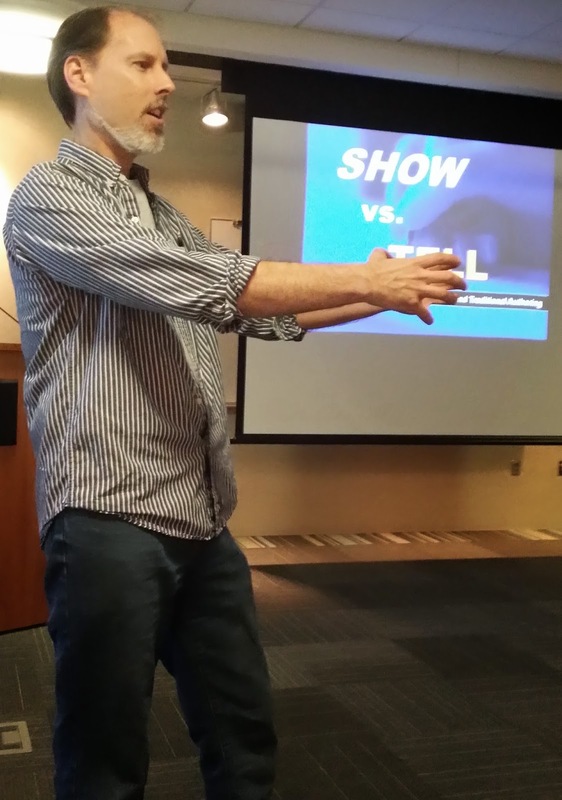 Screen writing is mostly “Show, not tell,” while novel writing is a lot of both show and tell. An informative Powerpoint presentation entitled “Show v. Tell” was presented. McWilson’s credits and accomplishments can be located on the Internet Movie Database (IMDb) at http://www.imdb.com/name/nm5815966/?ref_=fn_al_nm_1 . The meeting was adjourned. Dr. Carl Bloom, a Southeast MO State University literature professor will be the guest speaker at the July meeting. Saturday, July 19, 2014, 9:15a.m.-4:30p.m. Register for the first annual All Write Now! Conference to be held in Cape Girardeau, Missouri at the Cape Girardeau Public Library July 19 for a once-in-a-lifetime opportunity to have your novel published with Lou Turner and High Hill Press. Turner has generously donated a standard contract to one lucky attendee. She and her editors will work with the winning author to prepare the manuscript for publication. Once the manuscript/nonfiction book is ready for publication, High Hill Press will publish the book. That’s it! Well, almost. Like any good book, there’s a hook! To enter, you must have a completed fiction manuscript, in any genre, or a nonfiction book proposal, which should include an introduction, chapter-by-chapter outline, and first three chapters. That’s it! Almost. You must sign up to enter when you register for the conference. And you must be present to win. The drawing will be held after the final workshop of the day. Don’t wait. Seating is limited at the conference. For more information please contact Donna J. Essner at semowgpres@gmail.com or Mary Rechenberg at rechenbergm@yahoo.com. Please type ALL WRITE NOW in the subject line. Breakout sessions on building your writer’s platform, common mistakes writers make, how to self-publish on CreateSpace, research techniques, and more. Pricing and a complete schedule of breakout sessions and faculty will be available soon. If you’re interested in receiving more information and/or a registration form when it is available, please e-mail Donna Essner semowgpres@gmail.com or Mary Rechenberg rechenbergm@yahoo.com. Type ALL WRITE NOW in the subject line and your request in the body of the email. We're looking forward to seeing you in July! Since the President, Vice-President, and Secretary were all unable to attend, Treasurer Laura Luttrell and Historian Janet Cannon conducted the meeting. They welcomed several visitors, some of whom signed up to be members. Several members also had kudos to share including some who won awards at the Missouri Writers' Guild Conference. The Southeast Chapter again won Basket Wars! This year's trophy is new. No engraving plate will go on the base, but each chapter that wins will get to display the trophy for a year and keep a certificate. Our summer mini-conference, "All Write Now!" was the next topic. Everyone was still on-board to go ahead, so we put together some more ideas and the committee went on the next day to the Heartland Writers Guild to discuss further plans. The main idea is to get some of the small presses to come take pitches, perhaps talk on a panel, and have a variety of workshops for both fiction and non-fiction writers. Details will be out later this month. We're still having issues with getting our critique workshop off the ground. Many members are not receiving pieces. The idea was suggested that each person e-mail the critique group and when you get a piece, send a confirmation e-mail back. This seems to be the best idea so far. Members then shared some of the information they learned about pitching, platforms, and marketing from the conference. Several visitors asked for feedback on their issues and members shared their advice. Janet Cannon closed the meeting at 11:30. Next meeting is Saturday, May 31 so it doesn't interfere with Memorial day weekend. We as yet do not have a speaker. All in attendance were welcomed and guests and new members acknowledged. A reminder was given regarding the mini-conference and the date of the event was announced as July 19, 2014 at the Cape Girardeau Public Library. A signup sheet was passed around for position openings to assist in the conference. Kudos were given to Steve Duniphan for his submission making the front page of the Banner Press. A copy was passed around to be shared. The guest speaker, Brad Cook, was introduced. He is a writer/consultant, and the 2014 president of the St. Louis Writer' Guild. Brad's personal genre favorite is historical fiction and he is the author of a blog found at www.thewriterslens.com. In addition, Brad recently joined Blank Slate Press, a St. Louis based publishing company. The subject of pitching was presented. Mr. Cook stated that he has yet to have a pitch he's presented to be turned down and he submitted to the group his top requirements to achieve a perfect pitch. 1. The hook - do not use your work's first line. 2. Prepare an elevator pitch - 25-50 words encapsulating your entire work. Focus on the main theme and be sure to write it out. Create a "log line," which is a comparison of your work (i.e., Harry Potter meets Hunger Games), also known as "The Hollywood Pitch." It is recommended that you do some research on the agent/publisher you plan to pitch to, and then carve your Hollywood pitch in a genre the publisher/agent represents. 3. Is your work complete? Agents prefer that your work is complete. If your project has more than six months worth of work until complete, do not pitch. 4. Word count. Know your count and mention this information in your pitch. 5. Genre. Ensure that your genre is mentioned. 6. Main character must be mentioned. 7. Main plot should be revealed and possibly one subplot. 8. There is no need to have amazing credentials. Anyone can write - it's about the story and why you are the right person to write the story. 9. Get rid of generalities and clichés. Focus instead on why your story differs, not why it's similar. 10. If your piece is fiction, focus on the story. If nonfiction, focus on you, the writer—why are you the one to write this book? What’s your expertise? What do you plan to do after your book is finished (i.e., speaking engagements, support groups, etc.)? 11. Practice, practice, practice in an engaging, conversational manner. Do not read from a paper. 12. What do you do during the actual pitch? a. Do not use all your time, only use half so the agent can ask questions. Always expect the "gotcha question." b. Do not ramble; time is too precious to waste. c. Accept when your time has expired. Just stop. d. Do not expect the agent to take anything from you. Feel free to place the first page of your piece in front of you. The agent may be compelled to at least read your first line. This could make or break the pitch. e. Be positive—sell yourself. "Fake it ’til you make it!" In closing, Brad reminded of the most important fact—rejection is not about YOU, personally. It is always about your writing and/or the industry. It just may not be time, which is out of your control. Additionally, Brad stated he firmly believes that pitching is the best way to be picked up by an agent. Your name and face connected to your book has a valuable impact. The agent is there looking for a book, and remember, you're there with a book and that is a very beautiful thing. The meeting was adjourned at 11:40 a.m. for pitching practice by those in attendance. Donna Essner, president, opened the meeting with a greeting to all members and visitors. An introduction and acknowledgement of the new officers was made. Reminders of the attendance sheet and of the refreshment sign-up were given. 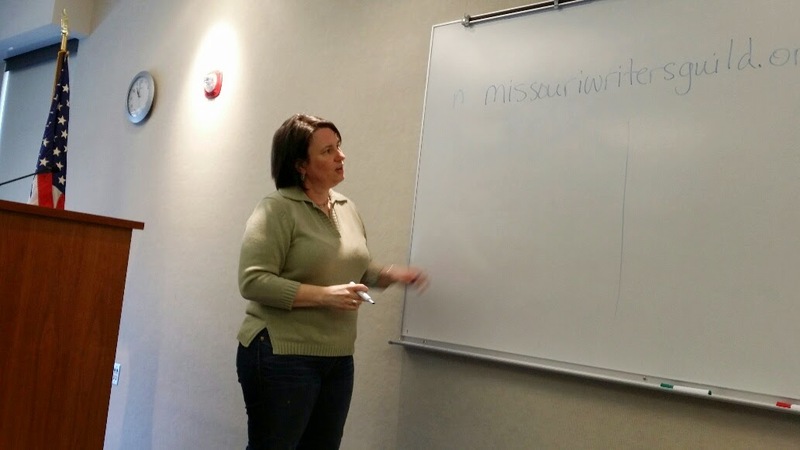 Additionally, Donna reminded of the multiple writers’ conference contests and recommended that each consider entering and stated that the location of additional information regarding the same could be found at www.missouriwriterswguild.org. In addition, the conference was recommended to everyone who could possibly attend, no matter the individual’s goals regarding writing. Many workshops are available for all interests. A summer mini-conference in conjunction with the Heartland Writers Guild was announced. Donna stated that a committee would be created soon to be composed of both guild’s members. The committee would delegate duties and aid in the creation of the workshop. Potential dates were given. An update would be given at the March SEMO Writers’ Guild meeting on March 29, 2014. A reminder of the Basket Wars that takes place at the MWG conference was given by Janet Cannon. Janet discussed the previous basket the SWG prepared and asked for donations. Any item could be donated; no limitation. An introduction of and brief bio of the speaker, Lisa Miller, was given. Ms. Miller discussed how her company, Walrus Publishing, came to be, which was out of desperation. She wrote for years and all during her years at St. Louis University. Although she didn’t feel she was a good writer she desired to write. Ms. Miller became a technical writer but quickly became bored and disinterested. Publication became a huge interest and a decision was made to invest in establishing own publication company. Ms. Miller believed she could market her company locally as St. Louis was a thriving location for writers but she was unsuccessful. She quickly realized that being “local” simply means those with whom you network, not necessarily geographical location. Mistakes were made along the way and money quickly ran out but she was learning, and continues to learn about the publishing business. and a “wish list” about the publishing process. The choices are many and so an educated decision should be made. The SWG thanked Ms. Miller for her time and for her insight. The meeting was adjourned at 11:45 with the announcement of a critique meeting to be held immediately following. The date of the next monthly meeting was announced as Saturday, March 29, 2014 beginning at 10:00 a.m., a change from previous beginning time of 10:30 a.m. Diverse group of people interested in writing and publishing a variety of genres.